Do you ever wonder about how the Egyptians built the pyramids? Or maybe even where modern day liberty symbols originated from? The answers are in this article. Cairo-Egypt. Digital image. The World’s Most Captivating Sunset Spots: Part One. N.p., n.d. We. The person who built the pyramids was Khufu, a king of the fourth dynasty. The three pyramids were built at Giza, which is just outside of modern day Cairo. To build them, it took about 20 years! The estimated date of completion is 2680 B.C. King Khufu had them built just before he died because they were for him, his son Khafrah, and his grandson Menkaure. The great pyramid was estimated to be about 455 feet high, have about 2,300,000 blocks, with each block weighing about 2.5 tons. The great pyramids were the largest man-made constructions in the world for about 4,000 years. The Hanging Gardens of Babylon. Digital image. Wikipedia. N.p., n.d. Web. The Hanging Gardens of Babylon were created by King Nebuchadnezzar II. He built it for his wife because she was homesick for the plants and gardens of her homeland. This seventh wonder was built in the sixth century B.C. If it were to exist it would be located on the bank of the river Euphrates. There is no documentation in Babylonian sources that the garden ever existed, but if it did exist it was likely to be the most beautiful man-made garden. The Statue of Zeus at Olympia. Digital image. Famous Wonders. N.p., n.d. Web. Next is the statue of Zeus (Jupiter) at Olympia. The statue of Zeus was, well, Zeus! Zeus was often called the “Father of the Olympic Games”. The statue was made of gold and ivory and was built sometime in the 5th century B.C. It was built to honor Zeus. The statue is assumed to be 40 feet tall. Roman emperor, Caligula, wanted the statue moved to Rome so that he could replace the head with a sculpture of his own. The Temple of Artemis. Digital image. Kusadasi.biz. N.p., n.d. Web. 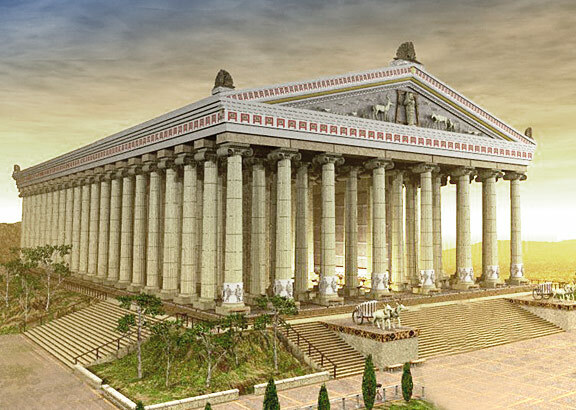 The Temple of Artemis was dedicated to Artemis (goddess of the hunt, forests and hills, the moon, and archery). The construction began at about 250 B.C. but was destroyed at about 262 A.D. If it were still standing, it would be somewhere in modern day Turkey. It was built with 60 ft. Ionic columns. This was Antipater of Sidon’s favorite ancient wonder. Mausoleum at Halicarnassus. Digital image. N.p., n.d. Web. The Mausoleum at Halicarnassus was built in 351 B.C by Artemisia because she was so heartbroken when her husband died she hired the most talented artist to build a tomb for him. The tomb was 147 feet high and sat on top of a hill overlooking Halicarnassus. It is located in present-day Turkey. Artemisia actually married her brother which seems very weird but it was very common back then. It took 24 years to complete building this structure but it was destroyed by an earthquake. The C. Digital image. Ancient Origins. N.p., n.d. Web. The Colossus of Rhodes was located on the Island of Rhodes (modern-day Greece). It was in the shape of the island’s patron god, Helios. It was made out of bronze plates attached to the iron framework. It was built between 292-280 B.C. but was destroyed in 226 B.C. by an earthquake. The statue was built to commemorate war victory. It was approximately 110 ft. tall! The Statue of Liberty was based on the 19th-century idea of what the Colossus at Rhodes looked like. Alexandria Egypt. Digital image. N.p., n.d. Web. The Pharos (Lighthouse) of Alexandria was a humongous lighthouse built by Ptolemy Soter, a ruler of Egypt. It was built between 280-268 B.C. It was located in Pharos Alexandria, Egypt to guide sailors into the port. It was destroyed by an earthquake in 1480. In today’s money, it would have cost about three million dollars to build. Zoe B. Student, Tatianna S. Student, Zoe B. Student "Wondering about the Seven Wonders by Tatianna Samuel and Zoe Bromfield" AwesomeStories.com. May 18, 2017. Apr 26, 2019.